Bibleman is extremely well known by parents of four to twelve year old. Pamplin Entertainment granted Covenant Studios an exclusive license to produce video games based on Bibleman, Cypher, and Biblegirl. A Fight for Faith is their first game. Visually this game looks a lot like the Sims. The team of characters (and yes you can have more than one at a time working for you) can not attack the enemies. Instead they can deflect the enemies shots back at them. There are different missions to accomplish like find all the parts of a machine to break up the deflecting the enemies shots back at them. The game faithfully follows the DVD, and includes some nice video from the episode. Bibleman is a sci-fi superhero Christian television show. The gameplay is really not my personal bag. I should explain two things: one this is a kids game; and two I am an aggressive video game player. Sitting and waiting to be attacked, only to defend myself is something that rubs me the wrong way. Yes, God is working on me in regards to patience. This is a concept that works good for kids though. Cypher and Bibleman have a very short reach in deflecting of shots, whereas Biblegirl uses a gun that makes deflecting the shots a breeze. This unbalance hurts the game. On the plus side, there is an interesting level in this game that can not be beaten. In fact losing this one level is required to progress. This concept is nice to see to spice up the gameplay. The graphics have amazing detail, and it shows. It is blatantly obvious to this reviewer that Covenant Studios spent a lot of time on the graphical details. They added a nice touch of being able to click on all objects in the game to have a little description come up. The cut scenes from the episode had the same quality as the DVD. The only drawback this reviewer can see to the graphics is they are a bit small. The angled overhead view is my personal favorite camera angle for playing video games. The sounds are done really well, and the voices sampled are a nice addition. Sadly, those voices can be used a bit too often in some levels. When you are already frustrated while trying to deflect shots, and you hear the same thing said by the Wacky Protestor (or his henchmen) ? well let us just say it does not help your mood. The controls a few of the keys on the keyboard (for swapping between team members), but the meat of the action is controlled by the mouse. The controls handled flawlessly. I found no fault at all with the controls. This game can be played on three different difficulties, but aside from that I can not see a lot of replay in Bibleman: A Fight for Faith. This is a standard action/adventure game where you beat each level, save, and move on. It was fun while it lasted (under four hours for this reviewer). It should take children longer than that to beat it. The only violence in this game is in returning the enemies shots back at them. When their life is gone, they vanish. There is no blood or gore. There is no bad language in this game at all. In fact the game even has an alter call in it to give ones life to Jesus Christ. Please note: that alter call is on the DVD episode. Sexuality is not addressed in this game at all. Biblegirl has armor that forms to the female body, however this is not sexual (at least not to the reviewer). There are no moral, or ethical issues in this game that are detrimental. The Wacky Protestor tries to turn some kids away from God, and Bibleman uses the Word of God to save the kids. A bonus 3 points is awarded for teaching Biblical values. 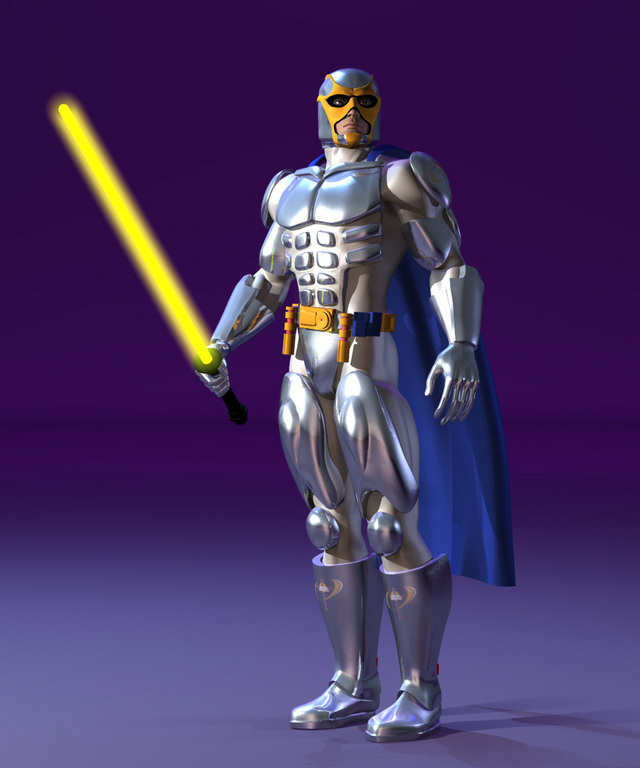 Bibleman: A Fight for Faith gives me mixed feelings. Covenant Studios did so many things right with this game, and it is their first video game ever. I was extremely excited when I installed this game, and started playing it. It took me a few minutes to become frustrated with the deflecting the shots, and dying with Cypher in the first level repeatedly. I was like, this is the Easy difficulty? So, I tried playing with Biblegirl (for a macho man like myself that was a stretch). Biblegirl was so easy that I felt like there was no challenge at all. I took time to enjoy the sounds, and music. I took time to wonder at the really cool level design (especially the maze level). The Wacky Protestor has some lines (about a chrome bumper) that had be laughing. Ultimately the decision is yours ? I only hope that I could give you the tools to assist in your purchasing decisions. God bless you and yours.